Wegmans Review Request Roundup - try saying that five times fast! Wegmans definitely pushes their own private label in stores- and for good reason. Many of their products are just as good (if not better!) than the name brand versions out there. Here are a few comparisons our users have requested. These two are fairly different. The Wegmans version has a thicker texture and tastes more natural (read: less sweet). The Gogo Squeeze pouches are slightly easier to open and have a sweeter taste. If you want a less sugary snack, go with Wegmans (5 fewer grams of sugar than Gogo Squeeze). But, we preferred the taste of the Gogo Squeeze overall. Wegmans all the way on this one. The Wegmans oatmeal had a thicker, more substantive texture while the Quaker oatmeal was mushy. Pro tip: instead of using the microwave with these instant oats, boil 2/3 cup of water and pour over the dry oats in a bowl. Stir and let sit for 2-3 minutes and you have much creamier oats than the microwave will give you! Don’t fix what’s not broken, Wegmans. While both are effective when in need of a tissue, the Kleenex tissues were a bit kinder on our noses. The Wegmans tissues felt rougher and thinner, so stick with the name brand on this one. These two are fairly similar. 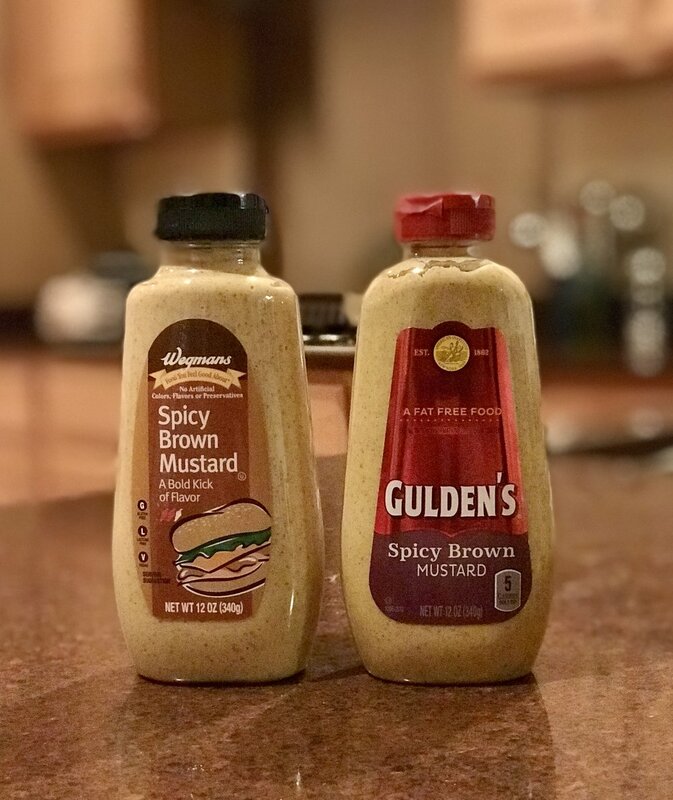 However, Gulden’s Spicy Brown Mustard definitely packs a harder punch: more flavor and more spice. If mild is your thing, go with Wegmans. If you like a little more kick, stick with Gulden’s. What other Wegmans products would you like to see reviewed?